Since 2007, Champions League sponsor Heineken have taken the trophy to fans in Africa, Latin America and Asia, giving fans the opportunity to have a glimpse of the ultimate prize. The UEFA Champions League trophy is set to visit two Nigerian cities in April as part of a tour to celebrate the top European club competition. The most coveted trophy in European club football will be on show in Uyo for the first time and the only other city in Nigeria asides Lagos to receive this. The trophy tour has previously visited Africa in 2009 and 2012 with the likes of Algeria, South Africa, Egypt, Tanzania, Kenya and Nigeria seeing to this. 2019 sees the trophy makes a return to Africa for the third time. With South Africa being the first beneficiary for this year (March 5-6), Nigeria is next on the list of African countries after which Namibia, Indonesia, Mozambique take turns. Heineken's 2018/2019 UEFA Champions League tour is entitled UNMISSABLE and is based on the belief that every match in the competition has Unmissable moments of action for everyone to enjoy. 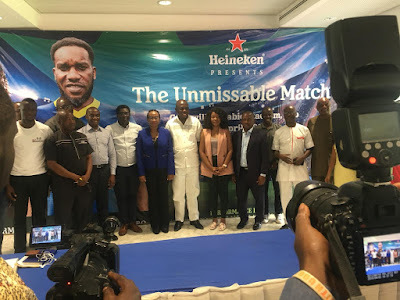 Portfolio Manager of the Nigeria Brewery plc Serah Agah at a press conference in Uyo reiterated the aim of the Unmissable match at the magnificent edifice of the Godswill Akpabio international stadium. "The cities of Lagos and Uyo were selected as Lagos is the commercial centre of Nigeria and Uyo has world class sporting facilities, good hospitality and extraordinary love of football by the fans. For three days we will tour the city of Uyo and Lagos as our legend Carlos Puyol accompanies the trophy to Nigeria". "The unmissable match was borne out of the idea to present Nigeria fans with the most remarkable football match Nigeria has ever seen". The match is scheduled to hold on April 16,2019 at 5pm Nigerian time with the stadium gate thrown open at noon. Team Chairman takes on Team shine shine Bobo with Nigerian legend Jay Jay Okocha captaining one of the sides. 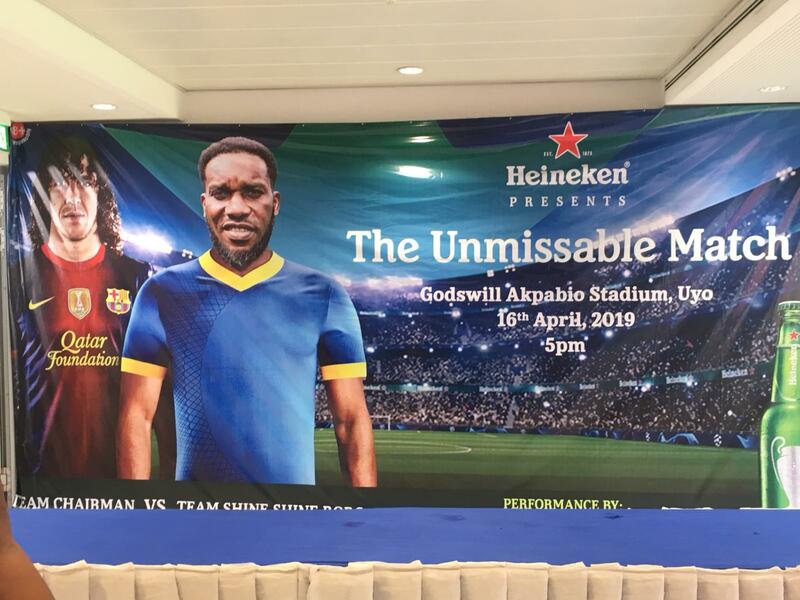 "Ex-Real Madrid defender Carlos Puyol will lead ten other Akwa United players for Team Chairman (Heineken team) with the marketing director of Nigeria Brewery plc Emmanuel Oriakhi as Technical Adviser. Nigerian legend Jay Jay Okocha will captain the Shine shine Bobo Team (star team) alongside other stars with Finance director Bob Kleinjan as Technical Adviser". Serah Agah further revealed that there would be plenty of entertainment on display on the day as fans at the stadium will also have the opportunity to view the champions league second leg fixture between Barcelona and Manchester United at 8pm Nigerian time. "I'm excited that NBL will give me and the good people of Akwa Ibom state the opportunity of seeing the UEFA CHAMPIONS LEAGUE TROPHY LIVE. This gesture has shown that sports in Akwa Ibom state is on the rise. The trophy is coming here. It is real. It is live. 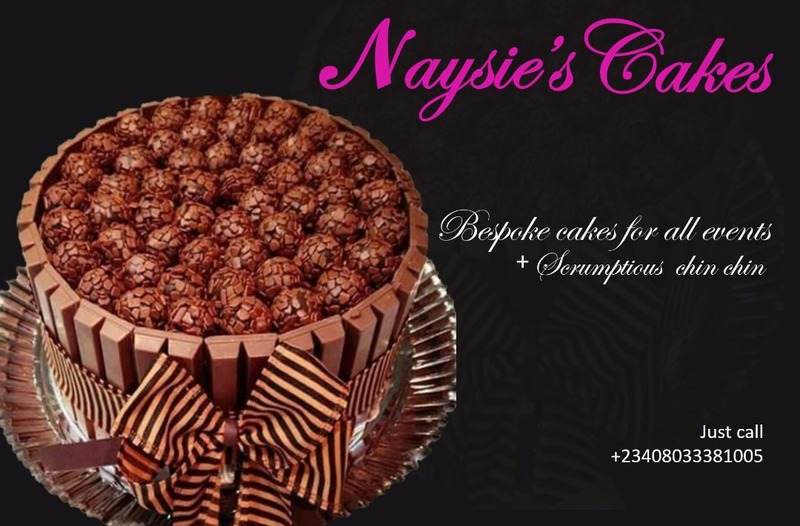 It will go round Uyo, then stop over at the government house before capping it up with the unmissable match. WHY THE FUSS ABOUT A MERE TROPHY? The UEFA CHAMPIONS LEAGUE is one of the most prestigious tournaments in the world and the most prestigious club competition in European football player by top best teams across various leagues in Europe. The competition attracts an extensive television audience, not just in Europe, but throughout the world. The final of the tournament has been, in recent years, the most-watched annual sporting event in the world with the 2012/2013 season the competition's highest TV ratings to date, drawing approximately 360 million television viewers. No wonder the massive interest in viewing the trophy of this prestigious tourney. WHAT REALLY IS THE TROPHY? The current UEFA CHAMPIONS LEAGUE TROPHY stands at 73.5cm tall, weighing 7.5kg. The trophy took 340 hours to make according to its designer Jurg Stadelmann. The current trophy is the fifth version of the current design. Real Madrid,Ajax, Bayern Munchen, Milan, Liverpool and Barcelona all have a version in their trophy rooms courtesy of a change in rule as regards the trophy in 2008/2009 season with the original trophy remaining with UEFA as against what was introduced in 1968/1969 season which stipulated that the cup becomes the property of any club which wins the competition five times or three years in a row. 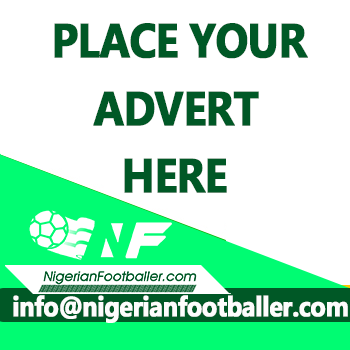 Welcome to Nigeria - Trophy Unmissable 2019.